Rustic and authentic Canadian style wood Chalet surrounded by wooded birch and spruce..
Sober, relaxing atmosphere and natural character are some of the features of this uniquely Canadian setting. Our rooms offer space and comfort for your stay in Charlevoix. 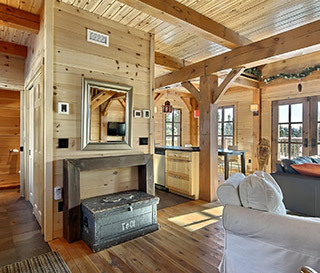 Built in 2009, this luxury wood chalet, available for rent, is a great achievement of the builders of the Villa Marvic. Covering an area of 1504 ft2, with a ground garden completely open space, this chalet, made entirely of wood, is the perfect place to escape in nature. The warm and inviting atmosphere of the place gives you all the excuses to relax for a moment. The large 33 000 ft2 wooded lot is located 10 minutes away from Le Massif de Charlevoix and Baie-Saint-Paul. Summer or winter, a variety of activities are offered in the Charlevoix region, such as: The great Garden Park, snowshoeing, dog sledding, kayaking, river or sea, agro-tourist road, Casino de Charlevoix, Baie-St-Paul art galleries and whale watching in Tadoussac ..! If you’re more open, take a ride to the nearby mountain area you will enjoy a breathtaking panorama. You can also go directly to the chalet on snowshoes! 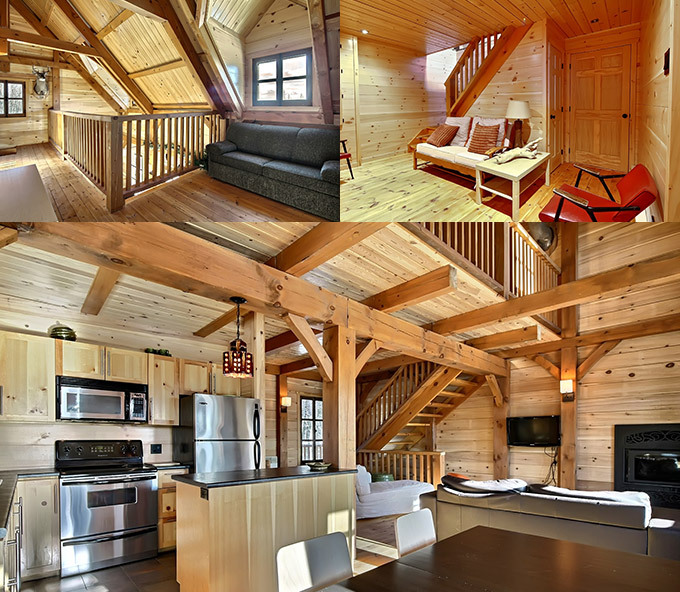 The luxury of the « cabin in Canada!»! 2 bedrooms, a shower, both with queen beds are in the basement. 1 large spa is located on the large outdoor gallery.